Clearwater, Florida became the nexus point for a Church of Scientology celebration to honor the exceptional life of L. Ron Hubbard. Mr. David Miscavige, the ecclesiastical leader of the religion, kick-started the grand celebration, presenting a panoramic update of the rapidly expanding landscape of Scientology. Scientologists from more than sixty nations gathered at the religion’s spiritual headquarters, the Flag Land Base, in Clearwater, Florida for a birthday celebration in commemoration of the religion’s Founder. In testament to his life, the annual weekend celebration displayed by turns, Mr. Hubbard’s research into man as a spiritual being, his technical legacy that allowed others to identify, explore and realize their innate spiritual abilities; and his continuing relevance in a still-troubled world. Thousands of Scientologists were on hand for the 2017 L. Ron Hubbard Birthday Gala to acknowledge Mr. Hubbard’s wide-ranging accomplishments, and to share with each other the impact of his knowledge and leadership on their lives. The evening presented not just a sense of L. Ron Hubbard’s influence on the lives of individuals, but also a surge of real-life stories on how he touched others… if only for just a little while, but ultimately changed the outcome of their destiny. The night further featured the presentation of the annual Birthday Game Winners, carrying on the tradition begun forty years ago of honoring Mr. Hubbard each year with expansion in every Scientology Church around the world. This year’s Birthday Game World Champions flew flags of nations from North America, Europe and Australia. The night’s spotlight continuously shone on the size and scope of Scientology today, spirited by L. Ron Hubbard’s legacy. Noting the more than 50 Ideal Churches that have opened in the last decade, including Auckland in January of 2017, Mr. Miscavige further announced forthcoming new Ideal Churches for the San Fernando Valley in Los Angeles; in Miami, Florida and Copenhagen, Denmark. NEW IDEAL CHURCH OF SCIENTOLOGY AUCKLAND The January grand opening of the National Church of Scientology of New Zealand was unveiled during Saturday evening’s event. Originally established in 1955 as the 2nd Church of Scientology in the world, their new home sits atop of Auckland to serve this “City of Sails” and the entire Kiwi nation. FUTURE IDEAL CHURCH OF SCIENTOLOGY VALLEY Located in the LA entertainment hub of the San Fernando Valley, this future Ideal Church of Scientology is the next to grand open. FUTURE IDEAL CHURCH OF SCIENTOLOGY MIAMI The future Ideal Church is situated on Highway US-1 in the heart of Miami and is undergoing renovations for grand opening in the coming months. FUTURE IDEAL CHURCH OF SCIENTOLOGY DENMARK Standing on Europe’s longest walking street, the future Ideal Church of Scientology Denmark is under construction for grand opening before the summer. Mr. Miscavige presided over a stirring two and a half-hour salute to L. Ron Hubbard. The evening was a celebration of a life well lived—a life lived for the benefit of all mankind, and a life lived to help individuals without hesitation. Capping the Birthday Gala was an inspired performance, led by award-winning jazz musician Mark Isham, in honor of Mr. Hubbard and the infinite gift of freedom he tendered to all mankind. The festivities extended across the Scientology campus in downtown Clearwater, with the Church’s historic Fort Harrison, Oak Cove and Sandcastle religious retreats, overflowing with parishioners celebrating the occasion. The Birthday Game World Champions were celebrated at the annual Winner’s Banquet. The annual International Association of Scientologists’ Patrons Ball, completed the weekend activities. The elegant night gave thanks to Scientologists who, through their extraordinary contributions, make possible the countless humanitarian initiatives carried out by the Church and its members, to millions around the world. To celebrate his March 13, 1911 birthday, each year Scientologists from sixty countries gather at the religion’s spiritual nexus in Clearwater, Florida in a weekend celebration of their founder’s life. This year, they acknowledged Mr. Hubbard’s seemingly endless accomplishments, and cast their eyes toward a limitless future, inspired by the life and works of L. Ron Hubbard. LRH, as his multitudinous followers know him, was a polymath—a person of wide-ranging knowledge and education. Beginning as the youngest Eagle Scout in American history (awarded just days after his thirteenth birthday), LRH explored the religious landscape of Asia by the time he was fifteen. Mr. Hubbard went on to become the Guinness Book’s most translated author, and also holds their record for most audio books by one author. His work toward the salvation of mankind continues to inspire millions worldwide. This annual weekend celebration displays by turns, his research into man as a spiritual being, his technical legacy that allows others to identify, explore and realize their innate spiritual abilities—all this L. Ron Hubbard left to a troubled world. The weekend also serves as an update of the rapidly expanding world of Scientology and all as a tribute to LRH. 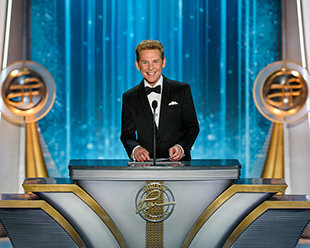 Mr. David Miscavige presided over a stirring two and a half-hour salute to L. Ron Hubbard. The evening was a celebration of a life well lived—a life lived for the benefit of all mankind, and a life lived to help individuals without hesitation. Over the course of an hour, Mr. Sherman proceeded to share an array of dazzling accounts from said witnesses—witnesses of LRH’s history that included sub-chasers in the Second World War, and military hospitals by San Francisco Bay, to New York City’s Hell’s Kitchen and even the genesis of America’s post-war counter-culture movement. Each one in its own right emphasized that wherever LRH walked and however random the lives he touched, he left an indelible mark. As this was his birthday celebration after all, the night also featured the presentation of the annual Birthday Game Winners, carrying on the tradition begun forty years ago of honoring Mr. Hubbard each year with expansion in every Scientology Church around the world. The spirit of the game is punctuated with straight up and vertical expansion—exactly what victory depends upon. It was that momentum which singled out the 2017 winners of the game. Participants in each class of Scientology Church flew flags of nations from North America, Europe and Australia: the Ideal Scientology Mission of Belleair, Florida; the Ideal Church of Scientology Milan; and following their grand opening just six months ago, both the Ideal Advanced Organization and Ideal Continental Liaison Office for Australasia. Representatives from each took the stage to receive applause from the lively crowd. The night’s spotlight continuously shone on the size and scope of Scientology today, spirited by L. Ron Hubbard’s legacy. His legacy was exquisitely personified in the unveiling of the newest Ideal Organization (Org) in Auckland, New Zealand. The Kiwi congregation formed the second Church of Scientology in the world in 1955, and Mr. Miscavige detailed out their new home atop of Auckland, noting that “Prominent doesn’t even begin to describe” the 1844 landmark site that is now the newest Ideal Church. Attendees next witnessed the moving grand opening ceremony with local luminaries heralding the moment as a sea change for their island nation. Noting the more than 50 Ideal Churches opened in the last decade, Mr. Miscavige further announced forthcoming new Ideal Churches for the San Fernando Valley in Los Angeles; in Miami, Florida and Copenhagen, Denmark. The evening was a celebration of a life well lived—a life lived for the benefit of all mankind, and a life lived to help individuals without hesitation. Birthdays are traditionally a time to acknowledge what a person has done and how they influence the lives of others. But as LRH is transcendent, his birthday celebration ultimately captured what his life and work will continue to mean for the future. The festivities extended to the Scientology campus in downtown Clearwater, where all six Flag accommodation facilities including the historic Fort Harrison, Oak Cove and Sandcastle religious retreats, overflowed with parishioners celebrating the occasion. The annual International Association of Scientologists’ Patrons Ball completed the weekend activities. The evening’s elegant event gave thanks to Scientologists who, through their extraordinary contributions, have made possible the countless humanitarian initiatives carried out by the Church and its members, to millions around the world. In all, it was a celebration in the name of helping people honor their own potential—of making a world that mankind desires, that he deserves.